February's disappointing jobs may have been an outlier, but other data and global economic slowdowns in continue to concern us. The 3Mo / 10Yr yield curve is just 7 bps separated, signaling a "risk off" economy with investors biding time. We're seeing prospective "grey swan"/ "black swan" risks from Brexit, North Korea, Iran, and Venezuela. NEW YORK (April 5th) - The March jobs report printed at a 196,000 new jobs. The consensus estimate had been just 180,000. Revisions for January (+1,000 jobs) and February (+13,000) netted 14,000 more jobs. The revisions resulted in average three months job creation of 180,000, jobs and six months average jobs creation of 203,000. That compares to 191,000 average three months and 191,000 six months new jobs last month and 218,000 and 220,000 for those same periods, respectively, for March last year. Job creation was up by 7.7% from the same month last year, which had printed at 182,000. 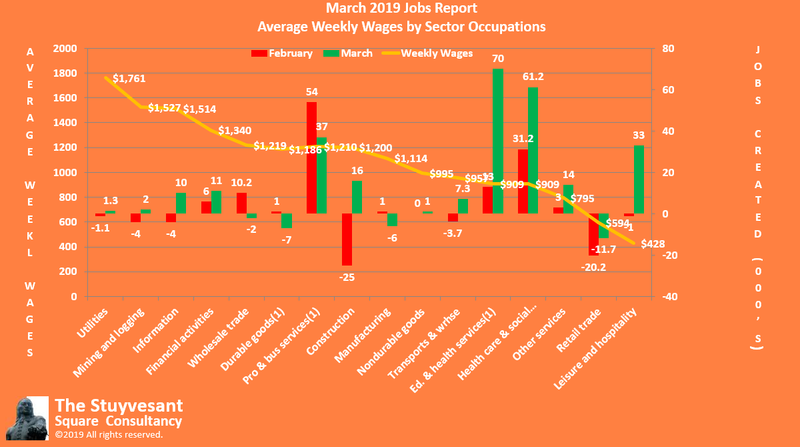 It was up 493.9% over February, which printed at just 33,000 new jobs and was, hopefully, an outlier. We have been saying since our November jobs report that we see a flashing red light, requiring investors and businesses to stop and assess conditions before moving forward. In March, we urged investors who were in or near retirement to move toward cash. Since then, we have seen China reduce its reserve ratio in early January and its economy has moved forward somewhat, there appears to be progress toward a China/US trade agreement, and the Fed has signaled it is more dovish. some odd trading patterns in currency pairs and interest rates and some “window dressing” in European banks, as pointed out by Gillian Tett in her Financial Times column this week. December Jobs Creation by Average Weekly Wage Source: The Stuyvesant Square Consultancy, compiled from BLS Establishment Data for March 2019. The number of people employed in March was 156,748,000 down by 201,000 from February, but up 1,588,000 from the same period last year. Some 162,960,000 individuals were in the workforce, down by 224,000 from the 163,184 who were in the workforce last month. The labor participation rate slipped 2/10ths of a percentage point, to 63.0%, down from 63.2% last month, but up from the 62.9% rate from March, 2018. The JOLTS survey for January, the latest available data, released March 15th, showed 372,000 new job openings from December. That’s an improvement over the 189,000 new job openings from November to December and a 1.260 million increase from January of 2018. But it is down from the year-on-year change from December, when 1.686 million new jobs had been created, year-on-year. OIL PRICING AND GEOPOLITICAL CONCERNS We're heartened to see fuel prices continuing below the $3 per gallon threshold. Gasoline prices for March are 8.4% higher than last month, but 4.2% lower than last year. But oil prices, as measured by West Texas Intermediate crude, have climbed 10.7%from last month as of April 4th, but are 1.4% lower than the same day last year. US sanctions against Iran will also adversely affect the economy of its neighbor, Iraq, thereby putting pressure on the country’s political regime.We remain concerned about Iran’s belligerent rhetoric and sanctions against Iran precipitating some unforeseen flash point in the region. The round of sanctions the White House imposed in November are claimed to be the harshest in our 40 year dealing with the Islamic Republic. Moreover, Iran’s Foreign Minister Mohammad Javad Zariff said just this week that he has all but abandoned hope for the Joint Comprehensive Plan of Action (“JCPOA”) with the European partners that remain after the US reneged on the Obama Administration deal. Instead, he said he is looking to what he described as “old partners”: Russia, China, Iraq and Turkey. Iran’s further estrangement from even the Europeans in favor of China, Russia, Iraq and Turkey troubles us. The loss of Europe in the JCPOA even further estranges Iran from the West and further enhances the odds Iran will abandon the USD as the currency for its oil trading, as we discussed in greater detail here. Iran can do more damage to the USA by joining the nations which have tried to “de-dollarize” oil because it could greatly diminish the USD status as the world’s reserve currency and wreak economic hardship upon the USA. Iran’s other threats seem less troubling. The Republic has said several times it would cease all flow of oil through the Straits of Hormuz if Iran could not sell oil because of U.S. sanctions. The regime has engaged in more missile testing, causing the U.S. to request even stronger sanctions from the UN. In February, it announced it had developed an indigenous surface-to-surface missile, Hoveyzeh. As of April 1, the USS John C. Stennis ( CVN 74) carrier battle group is posted off the coast of the Straits of Hormuz, off the coast of the UAE, relieving the USS Kearsage, with which Stennis swapped places just last month. The swap may be simply operational, but swapping in the Stennis may also signal higher levels of alert It appears the national command authority will continue to deter, if not intimidate, Iran’s leadership from pursuing misadventures in the straits. Similarly, in earlier months, we had concerns that higher rates and a stronger dollar impinge developing nations ability to repay dollar- and euro-denominated debt they owe to American and European banks. While the Fed has signalled it will be more dovish, we note, nevertheless, that the DXY:CUR is moving up, likely on weakness in the European economies and their currencies. Moreover, the Central Bank of China’s attempts at easing are yet to prove they will resuscitate the country's slowing economy. And the increasing amount of loans, including to struggling small Chinese businesses, estimated up 7%, year-on-year, raise the risk of higher defaults. So we continue to be concerned about foreign debt held by China as well as the strength of the overall economy. China has $750 billion in USD-denominated Offshore Corporate Dollar Bonds (or “OCDB”). Toward the end of last year, Nomura had warned to monitor the situation, and expressed concerns about the bond rollovers could be problematic, given the decline of the yuan. We have similar concerns, but mostly related to a weakening Chinese economy. With other developing economies, particularly India, where the USD:INR exchange rate had ended 2018 at 1:70, we’re seeing recovery, presumably because the Fed has pulled back. (The INR traded at its lowest point in history in October, 1:74. As of April 4th, it was 1:69.) War tensions with Pakistan just a few weeks ago, also seem to have while allayed. 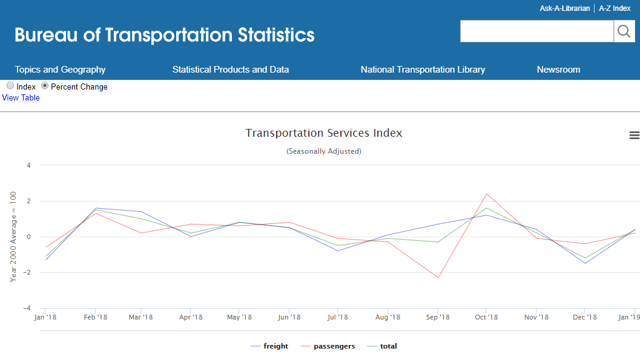 The wholesale trade report for January, reported March 22nd, showed sales up 2.7%, year-on-year and 0.5% month-on-month. Inventories were up 7.7% from last year and 1.2% month-on-month.The inventory to sales ratio was 1.34%, up from the 1.28% last year. Building permits for February, released March 26th, dropped 1.6% from January and were down 2%from last year. Housing starts plunged 8.7%, month-to-month and 9.9% year-on-year. 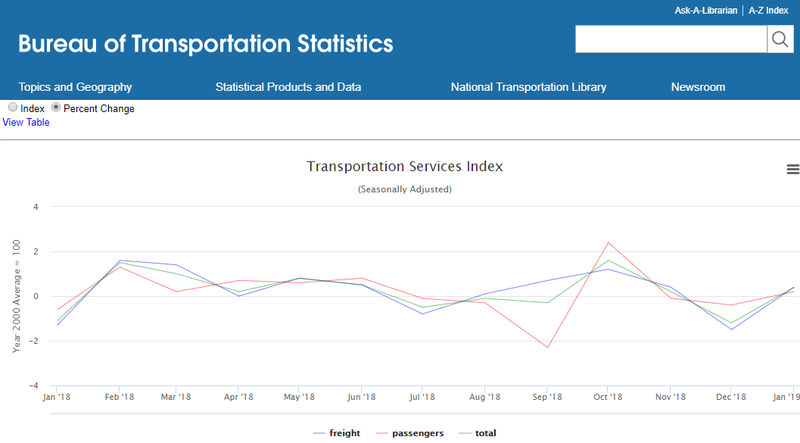 The ISM Manufacturing report for February, released March 1, showed continuing growth, at 55.3, up from 54.2 The ISM Non-manufacturing report for March, released April 3, printed at 56.1, down 3.6 points from 59.7 in February. Fed Normalizing For now, and in the continuing absence of inflation, we continue to be heartened by the Fed moving away from tightening rates too much, too quickly. 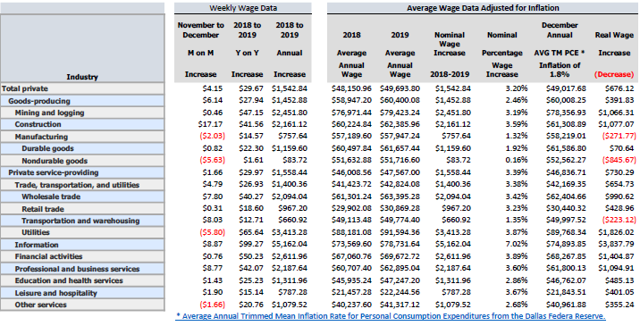 While inflation for personal consumption expenditures, less food and energy, or "Real PCE", had hit the Fed's target of 2 percent, we’re seeing that slip somewhat in the last couple of months. We continue to believe that moves toward normalization should take place more slowly and only after growth had become decidedly more robust over several more quarters; at least four quarters of a consistent 3 %GDP growth. We are only halfway to that goal as of 2018Q4. We would also like to see more stable growth in Gross Domestic Investment, with growth in that component of GDP of at least 1% to 1.5%, excluding inventory. As we have illustrated in our GDP report for 2018Q4, the 2018Q3 and 2018Q2, the better than expected GDP reports for those quarters included a lot of “shifting” from and to earlier or later quarters. And as we noted in our 2018Q3 report, there were signs of slowing, with 200 bps of the 3.5 %GDP growth coming from inventory restocking. As with Gross Domestic Investment, we would like to see steady, consistent, growth in each of the four categories of GDP growth.We have long held the view that trimmed mean PCE, produced by the Dallas Fed, is a better measure of inflation in the day-to-day costs of most Americans, it is currently 1.8%, but it has been volatile. The 3 % rate the Fed continued in its March meeting and the lowering inflation, will likely put a damper on further Fed normalizing. The yield curve, of which we have been gravely concerned in the last several months, is now simply dangerously volatile. The Fed rate hikes, which have their greatest effect on short-term rates (and why we use the 3Mo/10Yr curve) in 2018 premature and outpaced the economy's growth. We started 2018 with a spread of the 3 Month/10 year yield curve two of nearly 102 bps, just half the 200 or so bps that started 2017. Starting 2019, the 3 Month/10 year yield curve was just 15 bps apart. Yield curve inversions among the shorter term rates are becoming commonplace.The 10 year rate is barely able to sustain 2.50% so far in 2019. The 3 Month/10 year curve is now just 7 bps yesterday. We would like to see a minimum of two quarters of at least a 75 bps spread (pulling back from the higher 150 bps spread we had cited earlier) between the 3 Mo and 10 Yr yield before the Fed even considers another rate increase in what is in our view, an economy that is still somewhat anemic and at risk of recession. We are simply not seeing any holistic appetite among investors for increased risk, as signaled by moving away from Treasuries and into “risk-on” assets, which would tend to drive rates higher. (Treasury yields are inversely proportional to risk appetite, so the lower the Treasury rate, the more dollars invested there and not in risk-on assets.) Even with weakening foreign economies, we see an out-flow, versus an inflow, of foreign capital to the US, further heightening our concerns of a “risk-off” U.S. economy. With Asia, Europe and North America all showing evidence of a slow down, or at least early signs of one, we think it is vitally important for the finance ministers and central bankers of all three major economies agree a strategy to address what we foresee as a very challenging time later this year for the global economy. We remain unperturbed by the trade dispute with China, and by the Trump tariffs, but we’re not willing to ignore the “herd instinct” of ignorant investors who buy into the lie that “tariffs cause (or worsen) depressions”. (Milton Friedman’s estate has a Nobel Prize that says otherwise.) We’re seeing, it appears, increasing signs his threats of tariffs are bringing China to heel on its mercantilist trade policies. But until a deal is signed, we're cautious.That said, we would like to see the president engage America’s Asian and European allies to step up to join a "coalition of the willing" to challenge China's decades-old unfair trade practices and thefts of intellectual property because the one-on-one dispute could simply trigger mutual retaliation. There is more power in American dealings with Xi from a multilateral “we” than a unilateral “us”. We’re circumspect about the rate of GDP growth reflected in the last three reported quarters. We continue to believe the favorable numbers from 2018Q1 and 2018Q2 arose largely from stacking up GDP from prior and later quarters, as discussed here. Then, 2018Q3, at 3.5 percent, had a huge 2 %bump from an inventory build. 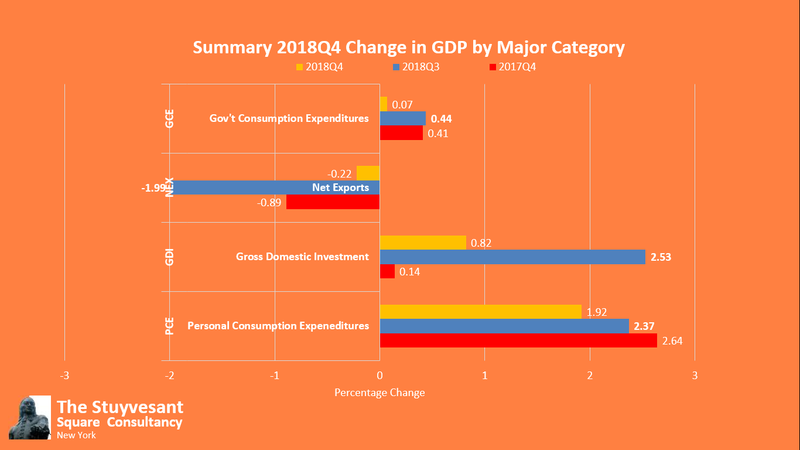 We think the 2018Q4 GDP of 2.6 %will likely presage continued lower growth for 2019.Our doubts will continue until we see two consecutive quarters of increases in all four categories of GDP (i.e., Personal Consumption Expenditures, Net Exports, Gross Domestic Investment, and Government Consumption Expenditures.) We predicted a slowing economy in our February jobs report and we are inclined to continue that view today. We expect 2019 Q1 to print at 1.9% to 2.4%, down from the 2.1 to 2.6 percent we predicted in our February jobs report. The narrowing yield curve, concerns about China and Europe, the increasing likelihood of a “No Deal” Brexit, the failed summit in Hanoi, the situation in Venezuela (now involving Russian and Chinese troosp) and Iran’s increasing isolation from the West all give us pause. We would not be surprised if 2019 yielded growth for the full year at 2% or less, all things being equal.We urge investors who are at or near retirement to continue at least a 75% cash portfolio, with prospects of reducing that next month, depending on the makeup of 2019Q1 GDP data. We simply don’t think there is sufficient potential prospect for capital growth in equities to justify equity risk given the possibility of a sharp market downturn on a grey or black swan event, such as a a resumption of North Korean nuclear testing, Iran totally abandoning the JCPOA to further embrace China and Russia and moving toward a bomb, further political troubles in the US or Europe or the US having to commit troops into Venezuela. Outperform: Consumer discretionaries in the mid- to high-end retail sector; trucking on speculation of consolidation and acquisition; companies or REITs that own real estate in sectors identified as "opportunity zones" under the Tax Cut and Jobs Creation Act of 2017; CHF. Perform: Consumer staples, energy, utilities, telecom, and materials and industrials. Lower-end consumer discretionaries, like dollar stores; the asset-light hospitality sector on speculation of stabilizing franchisee property values and room rental costs; certain leisure and hospitality; healthcare. Underperform: Financials; and technology; lower-end, low-quality QSRs (e.g., MCD, DPZ,Yum, etc. )on greater US delivery competition and a slowing economy; lower end hospitality on gasoline prices; currencies of developing nations, such as INR; and the GBP and EUR. Additional disclosure: Disclaimer: The views expressed, including the outcome of future events, are the opinions of the firm and its management and do not represent, and should not be considered to be, investment advice. You should not use this article for that purpose. This article includes forward looking statements as to future events that may or may not develop as the writer opines. Before making any investment decision you should consult your own investment, business, legal, tax, and financial advisers.